An AIA Site Preservation Grant funded a project to help protect the Underwater Maya Sites in Paynes Creek National Park (PCNP) through Archaeological Tourism by incorporating the nearby communities in grass-roots, sustainable tourism. 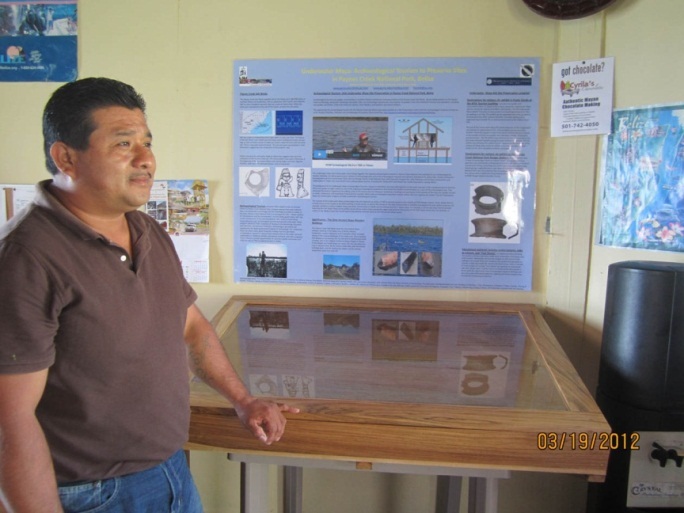 In March 2012 LSU PhD student Cory Sills and I opened two permanent archaeological exhibits, including one exhibit at the Belize Tourism Center in Punta Gorda, and another at the Ranger Station, some 30 miles away by boat in Paynes Creek National Park. 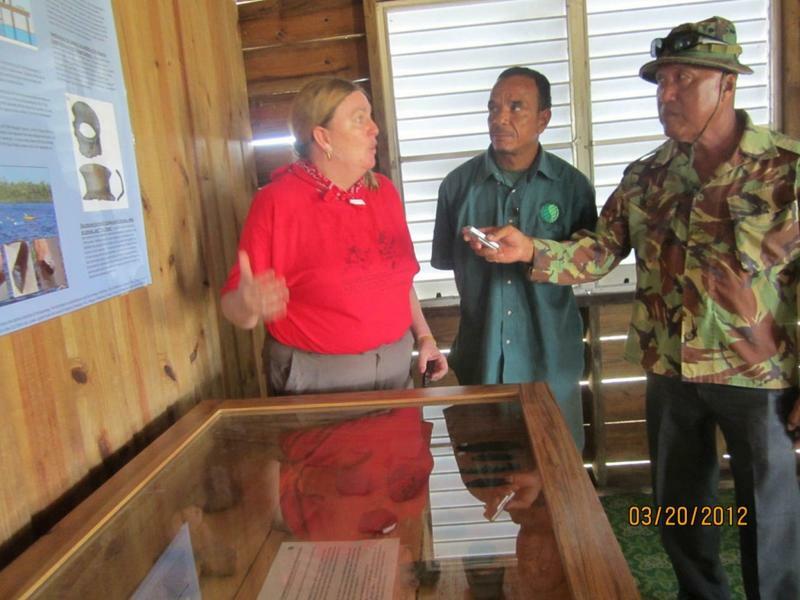 The opening of the town exhibit at the Belize Tourism Center in Punta Gorda was 10am on Thursday, March 15th. The exhibit includes a varnished wooden display cabinet with a lockable glass frame top, in which Cory and I placed the artifact replicas. 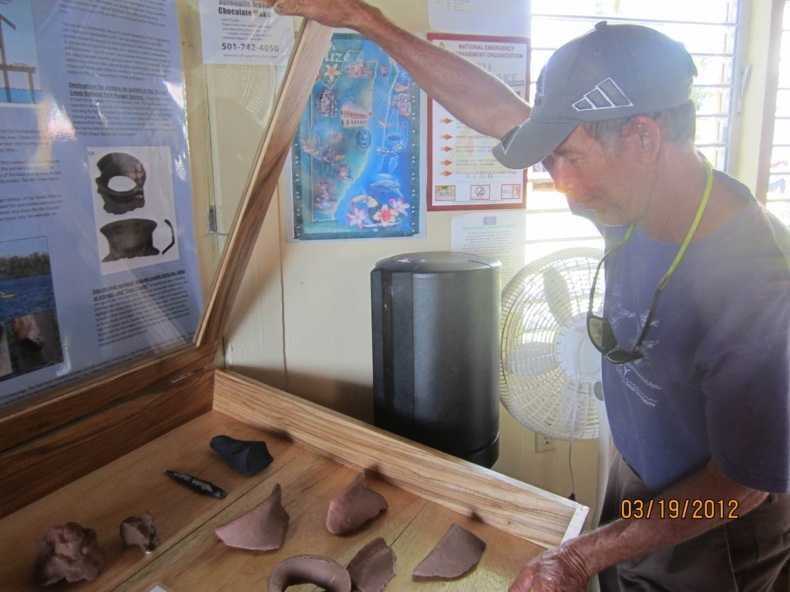 We were assisted by John Young, marine tour guide and project member on the Underwater Maya archaeology project. We positioned a laminated poster on the wall above the cabinet. The exhibit consists of high-quality 3D printed replicas of high-resolution 3D digital scans of artifacts from the underwater Maya sites printed in the LSU DIVA lab (Digital Imaging and Visualization in Archaeology; http://www.ga.lsu.edu/DIVALab.html). Using 3D printed replicas obviated government loans of actual artifacts to local agencies, as well reducing security requirements since the objects on display have no value on the international Antiquities Market. The opening of the Town Exhibit was introduced by Paul Villafranco, Program Manager for TIDE, with Heather McKillop then talking about the exhibit. Questions and discussion followed, along with refreshments following. There were about 20 people in attendance (capacity for the building). Three tourists arrived during the opening. The town exhibit was covered by PGTV (http://www.archaeological.org/news/currentprojects/8629) and by LoveFM correspondent Paul Mahung. We opened a second exhibit at the Paynes Creek Ranger Station Monday 20 March 2012 at the suggestion of local marine tour guides, who would be employed to take visitors to the Ranger Station, accessible only by water. We hired John Young as a boat charter to take us, along with the exhibit and Paul Mahung, reporting for LoveFM. Also in attendance were Stephanie Parham and Cal Timothy, employees from a fly-fishing lodge that hires local boat guides to take people fishing in Paynes Creek National Park. They learned a lot about the project by accompanying us. The boat ride took about one hour in calm seas, some 30 miles north in uninhabited marine waters, and then the lagoon system of the park. We were met at the Ranger Station by Terrestrial Manager Mario Muschamp and Head Ranger Leonard Williams, who helped bring the exhibit materials from the boat to the Ranger Station. Cory, Jackie, and I assembled the display cabinet and laminated poster in an alcove of the Ranger Station. The artifact replicas included some not in the town display, so the visit to the ranger station would not duplicate the town exhibit. Paul Mahung interviewed Heather and Mario in his preparation of a radio interview for LoveFm, which aired several times. Our plans are to periodically expand the exhibits and create new exhibits in other communities. Find out more about the Paynes Creek site and the Site Preservation Grant work being done there. 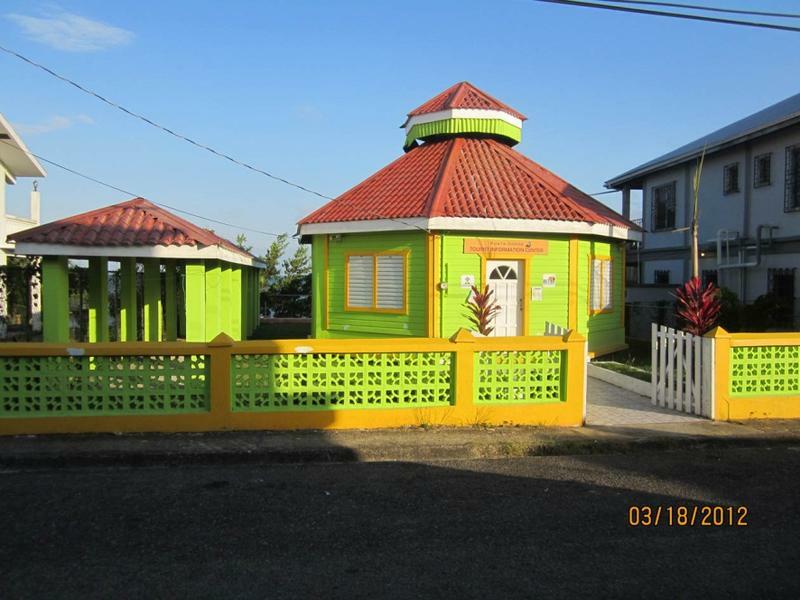 Learn about the Site Preservation Program.